I don’t mince my words when it comes to the awesomeness of Tapbot’s Tweetbot. It was one of the first apps I fell in love with on my iPhone, and is one of the only apps I use constantly. My affection for Twitter as a platform would not be as devout if it were not for this mobile app. Most of their users have probably downloaded their third iteration by now. It’s cleaner, more efficient and by far one of the most beautiful iOS 7 implementations I’ve downloaded. After nearly 24 hours with the new version, however, I am wondering if I need to go back to what I had. Why? They took away my triple-tap. Before you grab your pitchfork, let me place some context around that statement. When I was first introduced to the action of triple-tapping, it was a novelty I pulled out from time to time. Tweetbot allowed the user to designate what action was performed with the gesture. 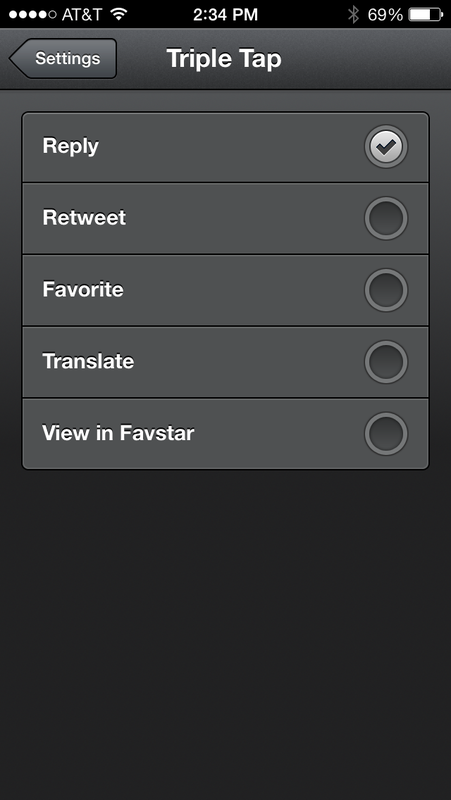 You could reply, retweet, favorite, translate, and view the tweet in Favstar. I tried the first three actions because I have no desire to translate tweets or use Favstar. What I settled on was favoriting because I discovered I could use that tab as my own personal bookmarking system. When I was settling in for some quality reading time, I could merely visit the favorites of the day and easily navigate and un-favorite them when complete. I was in heaven. Granted, I realize the new UX of favoriting is just as smooth and learnable as the triple-tap. As I discussed with co-workers this morning, there is probably some sort of metric behind the decision Tapbots made. It wasn’t the only change, though. On top of removing the unique gesture, you can’t access lists by touching the “Timeline” area of the main feed either. 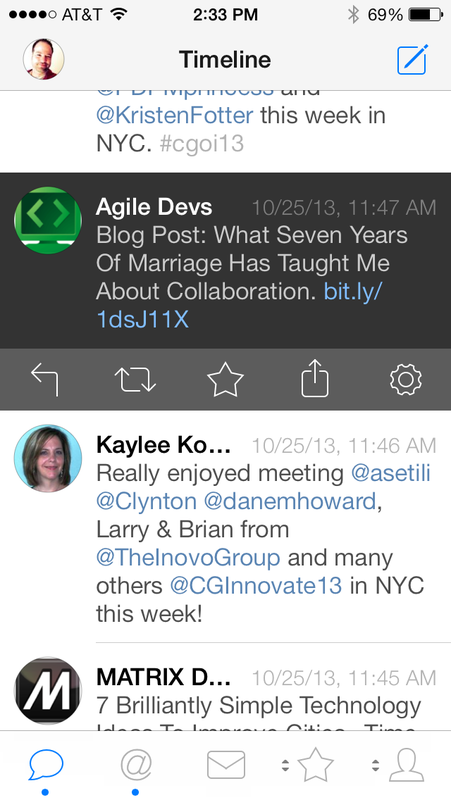 There is also a very stripped down version of a link displayed in-app after touching a link. Youtube videos are also more than a bit wonky. I interpreted that to mean my learned action wasn’t necessarily good just because it was different. Without knowing what the actual usage of that action are, I could be one of only a few users total that utilized the triple-tap. Instead of mastering the ability to tap your finger three times in quick succession, I am to believe that most would rather tap a tweet once and then touch the star icon to “favorite” an item. The same potentially goes for accessing lists, viewing conversations, accessing settings, or any of the other activity flows in the app. oard with that idea and am not in the practice of arguing with my strategy team because they are the experts at Bottle Rocket. The one time, however, I am on the wrong side of the convention and I was quick to defend my decision. OK, fine. I got defensive. For now, I am still making my mind up between Tweetbot 2 and 3. I will be using both for the next few days and decide then. I’m fine with paying for both because I really support the fine folks at Tapbot and want to see them continue on in their effort. The quandry comes from what works best for me. When Instacast updated to an updated iOS 7 design, there was no question that the new version was better than previous iterations. Thanks to my precious triple-tap, however, it’s not so cut-and-dry. Curious to hear the thoughts of others. What do you think works best? Is there a gesture or UX convention you wished would have caught on?